On this trip we visit the great game reserves of South Africa and Swaziland. We search for the Big Five in the renowned Kruger National Park and track both white and black rhinos in the Hluhluwe-Umfolozi Reserve. We also visit the Zulu battlefields and discover the wetlands of Greater St Lucia. We then travel to South Africa to explore the Western and Eastern Cape. Starting in vibrant Cape Town, we'll see African penguin colonies, taste world-renowned wines against the stunning backdrop of the Cape Winelands and go in search of Addo Elephants in one of the country's largest parks. This trip offers an excellent overview of the ever-changing Garden Route scenery: from long, wild beaches and the arid Karoo region to dramatic river valleys and rugged mountain ranges. We'll explore Tsitsikamma National Park on foot, sleep on the banks of the Breede River and look for whales (in season) from Plettenburg Bay. Heading south-east out of Johannesburg our first destination is the Drakensberg Mountains. Drakensberg is the world's oldest mountain range and derives its name from the Afrikaans word for 'Dragon Mountains'. In the inevitable mist and the razor back ridges one can see a likeness to these mythical beasts. The hikes, the plunge pools and all-round silence make the Drakensberg Mountains a must-see. The Drakensberg itself comprises basalt massifs that have been cut through by crystal clear streams. The indigenous people that lived here called these mountains the Ukhlamba, or barrier of spears, because all of their peaks resemble upturned weapons. The old San bushman culture is reflected richly in the paintings that dot the cliff faces and overhangs, reminding all South Africans of their rich history. Depending on our arrival time this afternoon, we may have the opportunity to take a short walk. We wake up to a hearty breakfast before having an opportunity to partake in a guided walk, where we will be able to experience the beauty of this mountain range first hand. The walk will usually take 4-5 hours and is of a moderate to challenging level of difficulty. Weather permitting, upon returning, our guide will have prepared a tasty 'al fresco' lunch enabling us to soak up the spectacular views of the Drakensberg. The afternoon is left open to either relax whilst enjoying a cool drink or perhaps continue our adventure with an unguided walk through the mountain valleys. Today we visit the famous battlefields. As anyone who has ever watched the film Zulu Dawn will know, the battlefields of Rorke's Drift and Isandlwana were the scenes of bloody and hugely significant events in the history of the Zulu nation. We will visit the battle sites of Rorke's Drift and Isandlwana to gain a perspective into the people and history of South Africa. Isandlwana is undoubtedly the most haunting of all the battlefields as the many white cairns reflect upon the arrogance of a Victorian empire and the victory of the Zulu people who call themselves 'the children of the stars'. The hill of Isandlwana stands a silent testimony to the determination and pride of the Zulu people. Isandlwana is truly haunting in the lessons it taught South Africa of colonialism and the folly of war. Rorke's Drift, a battle made famous in the film Zulu, is unique for the awarding of eleven VC's in a single engagement. We make our way to St Lucia after the battlefields where we will be based for the next 2 days. We rise early this morning to take advantage of the 'golden hour' on what is our first opportunity to experience a 'Big 5' safari. Umfolozi-Hluhluwe Game Reserve boasts the densest population of both white and black rhino in the whole of Africa. We will have a quick stop at one of the reserve's watering holes, where we can stretch our legs and freshen up before continuing on our journey through this ancient Zulu hunting ground. With over 500 species of birds recorded at this reserve it is also a paradise for any birdwatchers amongst us. In the mid afternoon, we depart for St. Lucia where there is the opportunity to experience the optional activity of a 'Hippo Cruise' on the Greater St. Lucia Estuary. The cruise meanders along allowing us to relax whilst viewing the hippos and crocodiles in their natural habitat as, once again, the sun drops from the African sky. Today is a day of leisure, where we have a choice of optional activities available in the area. There is the opportunity to continue our game viewing experience by taking an open game drive in the iSimangaliso Wetland Park, which was the first World Heritage Site in South Africa. The word iSimangaliso means miracle and wonder, which aptly describes this truly unique place. The day includes a 'braai' lunch and an option of an afternoon swim or snorkel in the Indian Ocean at Cape Vidal. There is also the chance to amble to the St. Lucia beach for a relaxing dip in the ocean or spend time walking the local forest trails. In the evening we can enjoy an exhilarating night game drive when all the nocturnal wildlife start their day. From November to February we can join a guided turtle tour in the Wetland Park. 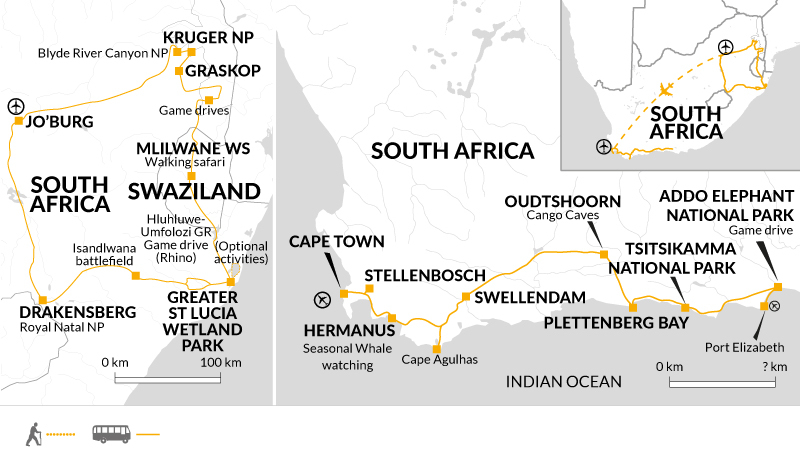 This morning we make our to Swaziland, during June to November we may have the opportunity to participate in the optional activity of whale watching along the way. We then drive north and enter Swaziland - a tiny, independent kingdom inhabited by the Swazi tribe who revere their king and take great pride in retaining their culture and traditions. Our journey takes us through some spectacular scenery in the Ezulwini Valley and past numerous traditional homesteads and curio stalls. In the late afternoon we enter one of Swaziland's best wildlife reserves, Mlilwane Wildlife Sanctuary. This secluded and beautiful sanctuary is a haven of tranquillity, located as it is in a natural bowl beneath the Nyonyane Mountains. Due to the high demand in Mlilwane, accommodation is subject to change without notice and can vary in style. We'll endeavour to stay within the park when possible, however, some departures may be staying up to a 15 minute drive from the sanctuary. The daily itineraries and activities will remain the same for all departures. Mlilwane is Swaziland's oldest protected area, owned and managed by a non-profit making trust, it is situated in the low foothills of the Nyonyane Mountains. The park has been rehabilitated to become Swaziland's most frequented reserve where one can enjoy the beauty of the surroundings and the abundant wildlife that grace these plains. Mlilwane has a large area of open grassland making game viewing and bird watching relatively easy and this morning we begin with a walk in search of zebra, wildebeest, nyala and warthog. The afternoon is left free to choose one of the optional activities available at the reserve, the absence of big cats allows us to partake in mountain biking or trail walking in a relaxed setting. The alternatives are to accompany our guide to the friendly local curios thus providing a real feel for the Swasi people and their culture, or relax and sit back to watch the local wildlife grazing outside our very own front door. After an early start we drive north re-entering South Africa and crossing the Crocodile River into the Kruger National Park. This two million hectare wilderness is amongst the world's first proclaimed game reserves and is justifiably South Africa's showpiece, boasting 147 mammal species. The park offers the 'Big 5' and over 500 recorded bird species along with scenery as diverse as riverine forest, granite outcrops, endless savannah and impenetrable mopani woodland. We take an open-vehicle game drive on our way to the camp area where we stay overnight. These camps areas benefit from modern infrastructure with toilet and shower blocks, restaurants and shops, as well as our accommodation. The Kruger National Park was established in 1898 to protect big game that had been hunted to near extinction, it is now one of the most prolific animal habitats in South Africa, committed to animal conservation. We depart camp for our morning game drive searching for sightings of the extensive wildlife that make this national park their home. We stop at various watering holes where we may see buffalo or antelope taking an early morning drink and hopefully a pride of lions nearby. We finish the morning drive by having lunch at one of the park's restaurants. Our afternoon game drive takes us to the Sable River, which is a major water source for the park's wildlife and a fantastic spot for game viewing. We leave the park in the late afternoon, climbing in excess of 1,000 metres to our overnight stop at Graskop. The airy uplands of Mpumalanga (formerly Eastern Transvaal) have been inhabited since Stone Age times and with the region's plentiful water from mountain rivers, multiple waterfalls, beautiful craggy escarpments covered in vegetation, and colourful birdlife, it is easy to understand why. We'll stop at several excellent viewpoints, including the aptly named 'God's Window' and admire the awe-inspiring Blyde River Canyon before making our way back to Johannesburg. This evening you will fly to Cape Town to join the Garden Route section of your tour. Our full day trip to Cape Peninsula will begin with a scenic drive via the white-sand beaches of Fish Hoek, stopping to explore the small but important naval base of Simon's Town. Later, we arrive at Cape of Good Hope, allegedly named due to the optimism once felt by arriving colonial sailors having successfully navigated the Cape and discovering a sea route to the East. We'll take an hour-long walk within the national park to Cape Point and the lighthouse, keeping an eye out for resident baboons, tortoises, otters and seabirds along the way. The trail is well marked, slightly rocky in places, and boasts diverse flora with many colourful flowers. We'll return to Cape Town via Hout Bay, an attractive fishing port once bordered by dense forest, hence its name, which translates as 'Wood Bay'. Here, we have the option of taking a short boat trip out to Seal Island - home to 1,000 Cape fur seals and guarded by the impressive, towering Sentinel Mountain. Alternatively, explore on dry land to see Hout Bay's active tuna, snoek and crayfish industry and find out why the town prides itself on offering some of the best fish and chips in the world. Today is left free for you to explore under your own steam. Consider climbing Table Mountain, on foot or by cable car, for the breath taking views over the Apostles, the Atlantic and the city below. The walk up to the viewpoint takes between three to four hours and is accompanied by our Explore Leader. Alternatively, an aerial cable car runs frequently to and from the summit, where a network of trails criss-cross the plateau and provide a variety of vantage points. Or you may prefer to take a trip to the Kirstenbosch National Botanical Gardens, which claims to be the most beautiful garden in Africa and is devoted to conservation of the Cape's indigenous species. With prior booking, you can visit the infamous Robben Island, the former prison where Nelson Mandela was incarcerated. There are departures at 9am, 11am and 1pm. A Robben Island visit and Table Mountain hike can be completed in the same day. If you'd like to do both, we recommend the 9am departure for Robben Island. For information on how to book this, please see the optional activities section or visit www.robben-island.org.za. Your Explore Leader will be able to give further local advice and recommendations on the optional activities. Late this afternoon, we'll leave Cape Town and head to the scenic winelands of Stellenbosch where you can relax with a sundowner on the terrace. Our hotel has a restaurant and there are a small selection of eateries just a short walk away. Please note: Table Mountain's cableway is closed for two weeks at the end of July for maintenance. Stellenbosch is world famous for its wine and today is a perfect opportunity to visit one or two vineyards for a tasting. Many are set within spectacular gardens and farmland, and offer the opportunity to have lunch and a stroll. A guided tour of Stellenbosch Town is also an option and a great way to learn about the many cultures that have come together to make Stellenbosch what it is today. One of the oldest of the colonial settlements, this charming town is made up of wide, oak lined streets and white washed, Cape Dutch architecture. There are many cafes, bars and delis to choose from for lunch and most pride themselves on using local produce. Or a more active option is to visit Jonkershoek Nature Reserve for a 2.5 hour walking excursion. Easy, scenic walking trails run through an important conservation area of indigenous forest, home to over 1,100 plant species, as well as a number of reptile and mammal species including the elusive leopard. This morning will be an earlier start as we make our way to Hermanus. A 90 minute drive takes us to the Betty's Bay area where we will have an included visit to Stony Point Nature Reserve. This reserve sits on the site of a historic whaling station and has a quiet, undiscovered feel, offering excellent penguin viewing without the crowds. The boardwalks can be followed over the craggy outcrops to see the resident seabirds up close without disturbing them. Although humans are not allowed to wander beyond the boardwalks, it does not always stop the penguins joining the trail and setting a slow walking pace! After a lunch break at Betty's Bay, we'll continue to our apartment-style accommodation in central Hermanus. This afternoon will be free to explore the coastal town. From July to November, Hermanus offers some of the world's best shore- based whale watching, with good opportunity to spot southern right, Bryde's and humpback whales. Although there is a good chance of seeing the whales from the water's edge in town, you may prefer to follow the coastal path to a better vantage point or join a boat trip excursion for a closer view. At other times of year, you may choose to spend the day exploring the galleries and museums in Hermanus, which are easy to discover on foot. Or if you developed a taste for South African wine while in Stellenbosch, then Hemel-en-Aarde wine valley (Heaven and Earth Valley) is just a stone's throw away, and offers a selection of wineries with views over the town and coast below. This evening will be at your leisure. There is a variety of traditional South African and seafood restaurants lining the streets. We'll stand on the southernmost point of the African continent this morning and see where the Atlantic Ocean meets the Indian Ocean in a white crash of waves. Now marked by a stone plaque, the 'Cape of Storms' was once a point of grave danger to European navigators and to the site of various evidential shipwrecks. We'll have some free time to explore here and get some lunch. We'll continue towards Swellendam this afternoon, leaving the main road to follow a gravel track to our river camp, where rustic, wooden a-frame huts line the banks of the Breede River. This accommodation offers a real break from reality and a chance to enjoy the surrounding nature. You can chat with the friendly team - many of which come from the nearby town - at the bar or around this evening's camp fire for an insight into their life on the Western Cape. Or find a relaxing spot along the riverbank to enjoy the peace and quiet. This evening a traditional, bush-style dinner will be served before a campfire under the starry sky (weather-dependent). This morning, if weather allows, there will be an option to try your hand at rafting along the Breede River in two-person inflatable rafts. The grade changes according to the water levels but generally rafting does not exceed grade two and all abilities are welcome. Alternatively, enjoy a coffee by the water's edge or a take a walk around the surrounding countryside of the Western Cape. There'll be time for lunch in the historic town of Swellendam. This town is small by most standards but is one of the oldest districts in South Africa. Rich in colonial history as an old trading post, the town has well-preserved examples of Cape Dutch architecture. Later this afternoon we'll make our way to Oudtshoorn, where we will be staying in a family-run property close to the centre of town. Depending on our arrival time you can use the pool and all rooms have outdoor seating to make the most of the afternoon sun. This evening is free to walk into town for dinner or perhaps have a barbeque in one of the outdoor eating areas. We start today by exploring the huge limestone caverns of the Cango Caves. These caves are an underground network of extraordinary structures, millions of years old. The combination of dripping rainwater and limestone has led to the creation of ancient stalactites, stalagmites and mighty rock columns. Allegedly, a local European farmer first discovered the caves late in the 18th century; however, there is research that proves the caves to have been used by man as far back as the Early Stone Age. Later this morning, we'll leave Oudtshoorn and make our way to the coastal town of Knysna. Here, we'll visit Knysna Heads Viewpoint, where two limestone cliffs emerge from the sea side by side, protecting a peaceful lagoon that runs inland from the sea. The lagoon is popular with tourists and local residents alike and is home to fishermen, water sports enthusiasts and many birds, including herons, kingfishers, African fish eagles and Knysna warblers. We'll have time to enjoy lunch on the waterfront this afternoon and wander around the quaint, little town before we depart on our final journey of the day to Plettenberg Bay. Our accommodation for the next two nights is a white-washed, seaside resort, set just a five-minute walk down to the unspoilt Keurbooms Beach. Today we'll take a short drive to Robberg Nature Reserve where our Explore Leader will lead a walk along the trails. The hiking here is moderate - it's uneven under foot in places and can be slippery so good walking shoes are advised, but rewards are abundant: brilliant bird viewing, sweeping coastal views and the possibility to spot dolphins and seals playing in the waters below. From July to December, there's also the chance to see southern right whales that come into the calmer and warmer waters to calve and nurse their young. After working up an appetite, we'll stop for a well-deserved lunch in Plettenberg Bay. After lunch, the afternoon is free with the option to relax on the beach, shop for souvenirs or join a whale-watching or kayaking excursion. We'll return to our accommodation in the late afternoon, when there'll be some free to time to relax before dinner - eat in the hotel restaurant, or choose a water-front eatery in Plettenberg Bay, and enjoy local wine alongside fresh seafood. This morning we leave on a short journey to Tsitsikamma National Park about 45 minutes away. Another hotspot for seasonal whale watching, the national park covers both land and sea, protecting important forest and marine areas and offering stunning coastal views. We'll be staying in the Storms River region where there are numerous well-marked walking trails for varying abilities, as well as the opportunity to explore suspended canopy walkways and zipwires, or to try river kayaking. Tonight we'll be staying in simple chalets set amongst the trees just minutes from the sea front. Try fresh seafood in the restaurant or cook up a traditional braai for dinner at one of the communal barbeque areas by the water. We leave the Tsitsikamma area this morning for another of South Africa's national parks, stopping for breakfast on the way. Home to more than 600 elephants as well as lion, hyena, cape buffalo and leopard, Addo Elephant National Park is our home for the last night of the trip. On arrival we'll swap into one of the park's safari trucks - perfect for the terrain and for capturing great wildlife shots - for a two-hour game drive with a park guide. Warthog are abundant here, along with various species of antelope, zebra and of course elephant. After our game drive there may be time to have a dip in the pool (open November - February) or enjoy the views from your room. Tonight's group meal is included and a visit to the viewing platform that overlooks the night-lit waterhole is a highlight of staying here and provides the opportunity for close-up viewing of the animals. Early risers can take a sunrise game drive with a park guide this morning. Heading out into the bush as the sun slowly peeks over the horizon is a thrilling experience that justifies the early start. The bush is cooler at this time of day, and bathed in majestic lighting - there's increased chance of seeing hyena and cats on the hunt for breakfast, and fewer cars. Our adventure ends after breakfast when we'll all leave together for Port Elizabeth. There will be two drop-off times at the airport: 11am and 1.30pm. Those on an earlier flight will be dropped off at the airport for check-in at 11am, while those with a late afternoon flight will have time for lunch in Port Elizabeth before getting to the airport at 1.30pm. Can be visited all year round. Most rain falls in the summer months (October-April). The climate during this period is generally hot and humid in the lowlands with temperatures sometimes up to 40°C. Winters (June-August) are much drier and colder, but still pleasant for travel. The high veld has a temperate climate. Average daily sunshine hours are high throughout the year. Seasonal weather patterns can be unpredictable. St. Lucia - Boat trip on Lake St. Lucia R260 pp; Full day Cape Vidal excursion (includes lunch) R750 pp; St. Lucia night drive to spot turtles (Nov-Mar) R950 pp; Whale watching (June-Nov) R1150 pp; Night game drive in St Lucia Wetland Reserve R525 pp. Mlilwane Wildlife Sanctuary - Mountain bike hire approx. R190. per hour; guided walk R155 pp. Kruger National Park - Night drive R235 pp. Please note that all St Lucia optionals are payable with cash only. Mlilwane and Kruger NP optionals can be paid by credit card as well as cash. Cape Town - Robben Island (3.5 hour tour) R340 pp; Kirstenbosch National Botanical Gardens R65 pp; Table Mountain cable car - from R293 return /R151 one way pp. Cape Peninsula - Seal Island boat trip R80 pp. Stellenbosch - Guided tour available R80 pp; Wine tasting R32 pp. Hermanus - Seasonal Whale watching boat trip R900-R1100 pp. depending on passengers. Plettenberg Bay - Seasonal Whale watching boat trip R900 pp; Kayaking R450 pp. Tsitsikamma NP - Canopy trail R650 pp. Addo NP - Sunrise game drive R400 pp. If you would like to book an excursion to Robben Island, the former prison where Nelson Mandela was incarcerated please use this link: http://www .robben-island.org.za/ It is very important that you book the 9am ferry on the last day of the trip. If there are spaces it is possible to book this excursion locally. Clothing should generally be lightweight for the day. A few warm fleeces and long trousers are strongly recommended as nights can be very cold, especially from May to August and in the highlands of Swaziland. A waterproof and windproof jacket are also recommended, particularly between October and April. Avoid brightly coloured clothing for game viewing. Take a swimming costume. Please note that it is forbidden to wear camouflage clothing in Swaziland. Comfortable walking shoes or lightweight boots for the treks, trainers or sandals for relaxing/travelling. Take a tough soft bag or holdall (or rucksack with detachable frame) suitable to be carried by 4WD vehicle. Total allowance: 44lb/ 20kg maximum (due to weight restrictions on our vehicle). Also take a daypack for items needed during any short walks and game drives (20-30 litre). Bring a torch, water bottle, sunhatunscreen and insect repellent. Binoculars are essential for game viewing and a 300mm lens is recommended for photography. Mosquito nets are not required as the accommodation provides screening where necessary. You may wish to tip your tour leader in appreciation of the efficiency and service you have received whilst on tour. Although entirely voluntary, tipping is a recognized part of life in this region of the world. Some local staff will look to members of the group for personal recognition of particular services provided. You should allow £45 per person for tipping (£25 for Zululand and Kruger Wildlife and £20 for the Garden Route). In order to make things easier for you, the Tour Leaders may organise a group's tips kitty and if this is the case, they will account for it throughout the tour. Both GBP and USD are readily exchanged. Please note that the banks and Forex Bureaus do not accept US Dollar notes pre-2002. Take your money in a combination of cash and an ATM card. Cash can be conveniently drawn on credit/debit cards from ATM's. Credit cards are usually accepted in large shops and restaurants. We do not recommend to take travellers cheques as these are quite difficult to exchange. South Africa has a good tourism infrastructure and generally good service standards. Our accommodation throughout this tour is varied to reflect the many aspects of this beautiful country. We use a combination of small, family run guesthouses, characterful park lodges, and we spend one night in a permanent tented camp. Some of the properties are owner-occupied and give a real taste of traditional South African hospitality and we love supporting these small local businesses. In St Lucia we stay at a local style lodge within the wetlands area. In Kruger we stay in small cabins or rondavels with shared facilities in an ablution block. This is our most basic accommodation on the trip, however it is still comfortable and is based in the heart of the national park, so it is possible to go to bed listening to wildlife. Due to the high demand in Mlilwane, accommodation is subject to change without notice and can vary in style. We'll endeavour to stay within the park when possible, however, some departures may be staying up to a 15 minute drive from the sanctuary. From the accommodation options we use for nights 6 & 7, each is characterful in style and offers a memorable expereince. In some cases, group members may stay in a different standard or style of room, this will be managed on the ground by the tour leader. In Swellendam, we stay away from the town in a quiet and picturesque setting by the bend of a river. The accommodation is simple, rustic, featuring en-suite facilities and well suited to the natural and peaceful environment. Dietary requirements: Most restaurants and hotels in Swaziland do not have a wide selection of vegan and vegetarian choices. There is usually a choice of salads and one main vegetarian and/or vegan main dish on the menus, but choice will be limited especially in more remote locations. If you have specific dietary requirements we do recommend for you to bring some food with you. New Zealand passport holders do require a visa, please consult your local consulate for full information. Other nationalities should consult their local embassy or consular office. Please ensure you have the correct multiple entry visa, especially if you are visiting another country on your itinerary and will need to re-enter South Africa - this includes visiting Swaziland. All visitors should ensure their passport is machine readable and has two blank pages when entering and leaving South Africa. The South African Immigration officials will not allow child/ infant pages to be used for this purpose and visitors without the stipulated blank pages will be denied entry. Swaziland: Visas are not required by UK, Australian, New Zealand, and Canadian citizens. Other nationalities should consult their local embassy or consular office. Please note that you will be required to supply a yellow fever certificate that has been issued at least 10 days prior to arrival in Swaziland if you have travelled from or via a country where yellow fever is endemic. We recommend protection against malaria, hepatitis A, tetanus, typhoid, polio and diphtheria. Consult your travel clinic for latest advice on different prophylaxis available against malaria. Please check the latest requirements with your travel clinic or doctor prior to departure. The above is not an exhaustive list. Further information regarding vaccinations and travel health advice can be found by following the NHS and NaTHNaC links at Explore Travel Health and from your local healthcare provider. Visa and vaccination requirements are subject to change and should be confirmed by you before travelling.